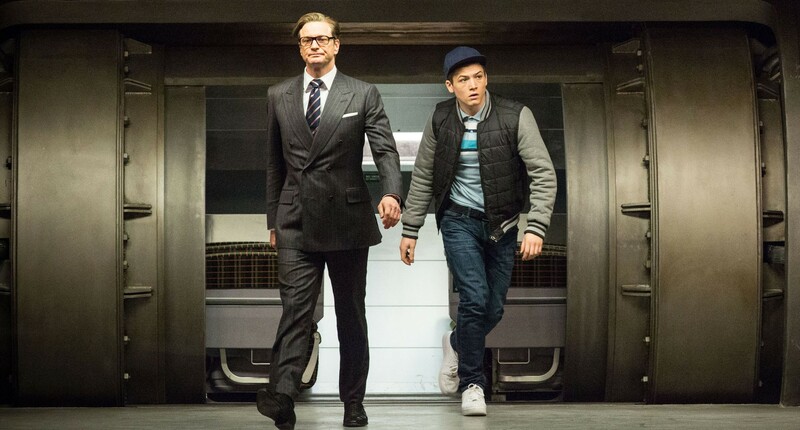 “Kingsman: The Secret Service” is the new, old Bond. Yay! We’d all grown tired of the twittier aspects of old Bond: the sclerotic formula, sclerotic Q, ancient M, silly villains, silly lewd female names, mildly lewd one-liners, and the ever-increasing Roger Moore and Pierce Brosnan banality. The removal of twit and anchoring in grit, set off by the Jason Bourne films and the further grit-ification of Bond (compliments of Jack Bauer), was enjoyed by no one more than the reviewer. And yet, now that the old-school Bond archetype is back, we find we’ve missed it. No one does debonair gentleman spies better than the Brits. The “Bond” franchise can kill two birds with one stone if the next Bond is Idris Elba; they’ll have succeeded in keeping the Daniel Craig grit and reinstating the gentlemanly Sean Connery suave. And this needs to happen. Why? Because “Kingsman,” should it become a franchise (and it has every indication that it will), is not really resurrected Old Bond. It’s certainly an upgrade, fun and funny-wise, but it’s got stuff in there that no gentlemanly Bond would ever have considered, let alone partake in. We can’t even talk about what that might be without losing couth. “Eggsy” (Taron Egerton) is a young, parkour-practicing, stolen car donut-spinning, working-class British tough, recruited by Colin Firth’s tweedy bespectacled Harry “Galahad” Hart, to try out for a top-secret intelligence agency. Working out of a crème de la crème, bespoke tailor shop, the Kingsmen were founded in 1849 to clothe powerful Brits and have now become a sophisticated international intelligence agency, powerful beyond belief. “Suits are the modern man’s armor,” says Galahad. The Kingsmen are new British knights. That’s why they have Roundtable call-signs. Kingsman bootcamp blows away normal special ops training: Recruits are required to sign a waiver covering possible departure from the program in a body bag. If they depart the training and blab about the program, they’ll depart the planet in a body bag. Eggsy’s immediately up against snooty, upper-class Oxford and Cambridge recruits. You know the stereotype: superior, entitled, rotten at the core. HALO parachute jumps! Navy frogman underwater testing! Even neurolinguistic programming! All very exciting! So while all that’s underway, we meet the villain. It’s Sam Jackson with a ridiculous lisp. Sam’s a techno-geek named Valentine with a cardigan and a B-boy sideways ball-cap, who aims to rid planet Earth of its No.1 parasitic plague—95 percent of humans. The main issue is that ‘Kingsman’ puts at risk the concept that being a gentleman has nothing to do with class, but about how you behave. By way of free phone service. Beware that free SIM card! Touch it and you’ll find yourself tying to bite your neighbor to death. The scariest thing is, his global warming-inspired mass extinction plan makes very good sense, if you’re a psychopath. A scene of mass slaughter at a church service shows us the effects of the SIM-card culling. It’s supposed to be funny, and for 15 seconds it is, but then it goes on. And on. And on. It’s effective and very nasty, but the fact that it’s played for laughs leaves one eventually feeling duped, hollow, and used. So what should be done about lispy Valentine and his Trojan-horse phone service? 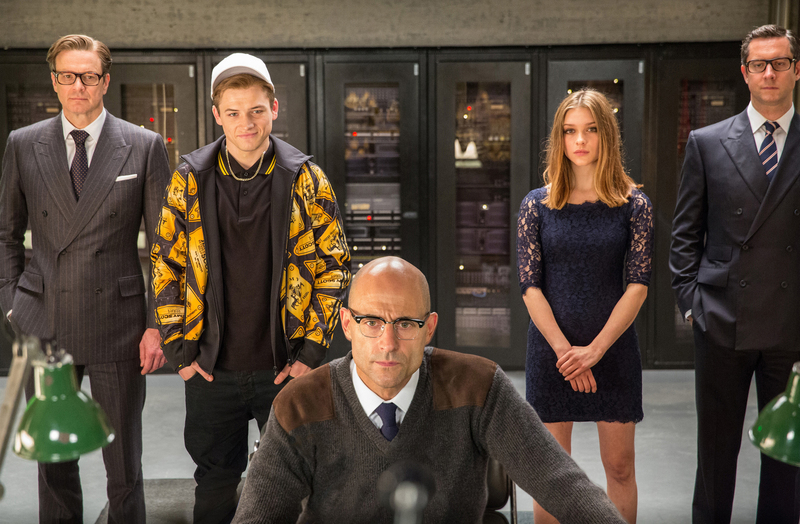 Well, Eggsy turned out to be too nice for the Kingsman program. But when a veteran Kingsman dies and another, higher-up Kingsman is discovered doing dastardly deeds in cahoots with Valentine, Eggsy gets called back in. Sort of like Maverick in “Top Gun.” He didn’t graduate but he’s got the goods, so he can be a Kingsman wingman any day. Who will triumph? Will they get their hands on Valentine before he can satellite-activate all zombie-producing (like the ones in “28 Days”) SIM cards? Egerton-as-Eggsy’s sneering attitude covering up a faithful heart is dead on, Mark Strong as “Merlin” (the Kingsmen’s “Q”) is highly effective, and Colin Firth takes a surprising number of bricks out of the wall standing between himself and an action-film career. The film’s a hoot and a riot. It’s an extremely engaging ride, with no minute wasted on the extraneous. There’s clearly been some heavy script-borrowing from 1982’s “Trading Places.” The film is referenced often, and Eggsy’s transformation from street urchin to gentleman is likened to that of Billy Ray Valentine’s (Eddie Murphy) transformation from con artist to gentleman. But that’s of little consequence. The main issue is that “Kingsman” puts at risk the concept that being a gentleman has nothing to do with class, but about how you behave. Because there’s one wrong note in the film that’s just so glaringly out of line, so egregiously off (Eggsy indulges in highly ungentlemanly conduct) that it undercuts all forgoing talk of gentlemanliness. Which is a shame. As mentioned above, no one does debonair gentleman spies better than the Brits, but the moral bottom has dropped out. Ian Fleming once wrote of the “Bond” character M, words to the effect that, in every true leader presides the Jesuit and the Calvinist. Let’s just say that if M disapproved of Bond’s womanizing, he’d have had a heart attack over Eggsy’s version.